"Farage" redirects here. For the surname, see Farage (surname). 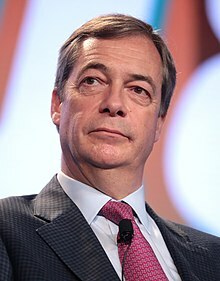 Nigel Paul Farage (/ˈfærɑːʒ/; born 3 April 1964) is a British politician, broadcaster, campaigner, political analyst and former businessman currently serving as Leader of the Brexit Party since 2019 and as a Member of the European Parliament for the South East England constituency since 1999. Outside of his Brexit Party and MEP duties, he also serves as a Vice-Chairman of the pro-Brexit organisation Leave Means Leave, and is the host of The Nigel Farage Show, a live radio phone-in on the Global-owned station LBC. He is best known as the former Leader of the UK Independence Party (UKIP) from 2006 to 2009 and again from 2010 to 2016. He co-chairs the Europe of Freedom and Direct Democracy (formerly "Europe of Freedom and Democracy") group. Known as a long-time prominent Eurosceptic in the UK, he has been noted for his European Parliament speeches, and a critic of the euro currency. Farage was a founding member of UKIP, having left the Conservative Party in 1992 after the signing of the Maastricht Treaty. After unsuccessfully campaigning in European and Westminster parliamentary elections for UKIP since 1994, he was elected MEP for South East England in the 1999 European Parliament election. He was re-elected in the 2004, 2009 and 2014 European Parliament elections. In September 2006, Farage became the Leader of UKIP and led the party through the 2009 European Parliament election, when it won the second highest share of the UK popular vote, defeating Labour and the Liberal Democrats with over two million votes. He stepped down in November 2009 to concentrate on contesting Buckingham, the constituency of the Speaker, John Bercow, at the 2010 general election, coming third. In November 2010, Farage successfully stood in the 2010 UKIP leadership contest, becoming Leader of the Party once again following the resignation of Lord Pearson of Rannoch, who voluntarily stepped down as Leader in August that year. Farage announced his resignation as leader when he did not win the South Thanet seat in Kent at the 2015 general election, but his resignation was rejected and he remained in his post. In June 2016, Farage was a prominent supporter of the successful campaign for a vote in favour of leaving the EU in the UK EU membership referendum. On 4 July 2016, Farage again announced his resignation as leader of UKIP, triggering a leadership election. Diane James was elected to succeed him, but she resigned as leader after just 18 days and Farage became interim leader on 5 October 2016. A second leadership election was held in November, which was won by Paul Nuttall, who thus succeeded Farage. Farage was ranked second in The Daily Telegraph's Top 100 most influential right-wingers poll in October 2013, behind Prime Minister David Cameron. He was also named "Briton of the Year" by The Times in 2014. In 2017, Farage began contributing to the American television network Fox News. In 2018, Farage joined Leave Means Leave. On 4 December 2018, Farage announced his resignation from UKIP over the appointment of Tommy Robinson as an adviser to the UKIP leader Gerard Batten and the decision of the National Executive of UKIP to keep Batten as leader of the party. On 13 February 2019, Farage confirmed on his Twitter account that he would now sit as a member of the Brexit Party in the European Parliament. On 22 March 2019, Farage was officially announced as the new Leader of the Brexit Party after Catherine Blaiklock's resignation. Farage was born in Downe in Kent, England, the son of Barbara (née Stevens) and Guy Justus Oscar Farage. It has been suggested that the Farage name comes from a distant Huguenot ancestor, although research suggests that the name was originally Farridge. One of his great-grandfathers was born to German parents who migrated to London in the 19th century. His grandfather, Private Harry Farage, fought and was wounded in the First World War. His father was a stockbroker who worked in the City of London. A 2012 BBC Radio 4 profile described Guy Farage as an alcoholic who left the family home when Nigel was five years old. In 1971, Guy Farage gave up alcohol and entered the antiques trade, having lost his Stock Exchange position; the next year, endorsed by friends, he returned to the trading floor at the new Stock Exchange Tower on Threadneedle Street. From 1975 to 1982, Farage was educated at Dulwich College, a fee-paying independent school in south London. In his autobiography he pays tribute to the careers advice he received there from England Test cricketer John Dewes, "who must have spotted that I was quite ballsy, probably good on a platform, unafraid of the limelight, a bit noisy and good at selling things". After leaving school in 1982, Farage decided to seek employment in the City of London, trading commodities at the London Metal Exchange. Initially, he joined the American commodity operation of brokerage firm Drexel Burnham Lambert, transferring to Crédit Lyonnais Rouse in 1986. He joined Refco in 1994, and Natexis Metals in 2003. Farage was active in the Conservative Party from his school days, having seen a visit to his school by Enoch Powell and Keith Joseph. In 1981, an English teacher, Chloe Deakin, wrote to the head teacher of Dulwich College, David Emms, asking him to reconsider his decision to appoint Farage as a prefect; she had not met Farage, but cited concerns expressed by others over Farage's alleged 'fascist' views. Farage later stated that some teachers were hostile to him because he was an admirer of Enoch Powell. Farage said: "Any accusation I was ever involved in far right politics is utterly untrue." He voted for the Green Party in 1989 because of what he saw as their then "sensible" and Eurosceptic policies. He left the Conservatives in 1992 in protest at Prime Minister John Major's government's signing of the Treaty on European Union at Maastricht. He was a founding member of UKIP in 1993. Farage was elected to the European Parliament in 1999 and re-elected in 2004, 2009 and 2014. In 1999 the BBC spent four months filming a documentary about his European election campaign but did not air it. Farage, then head of the UKIP's South East office, asked for a video and had friends make copies which were sold for £5 through the UKIP's magazine. Surrey Trading Standards investigated and Farage admitted the offence. Farage was the leader of the 24-member UKIP contingent in the European Parliament, and co-leader of the multinational Eurosceptic group, Europe of Freedom and Direct Democracy. Farage was ranked the fifth-most influential MEP by Politico in 2016, who described him as "one of the two most effective speakers in the chamber". On 18 November 2004, Farage announced in the European Parliament that Jacques Barrot, then French Commissioner-designate, had been barred from elected office in France for two years, after being convicted in 2000 of embezzling £2 million from government funds and diverting it into the coffers of his party. He said that French President Jacques Chirac had granted Barrot amnesty; initial BBC reports said that, under French law, it was perhaps illegal to mention that conviction. The prohibition in question applies only to French officials in the course of their duties. The President of the Parliament, Josep Borrell, enjoined him to retract his comments under threat of "legal consequences". The following day, it was confirmed that Barrot had received an eight-month suspended jail sentence in the case, and that this had been quickly expunged by the amnesty decided by Chirac and his parliamentary majority. The Socialist and Liberal groups in the European Parliament then joined forces with UKIP in demanding the resignation of Barrot for failing to disclose the conviction during his confirmation hearings. In early 2005, Farage requested that the European Commission disclose where the individual Commissioners had spent their holidays. The Commission did not provide the information requested, on the basis that the Commissioners had a right of privacy. The German newspaper Die Welt reported that the President of the European Commission, José Manuel Barroso, had spent a week on the yacht of the Greek shipping billionaire Spiros Latsis. It emerged soon afterwards that this had occurred a month before the Commission under Barroso's predecessor Romano Prodi approved 10.3 million euros of Greek state aid for Latsis's shipping company. It also became known that Peter Mandelson, then the British EU Commissioner, had accepted a trip to Jamaica from an unrevealed source. Farage persuaded around 75 MEPs from across the political divide to back a motion of no confidence in Barroso, which would be sufficient to compel Barroso to appear before the European Parliament to be questioned on the issue. The motion was successfully tabled on 12 May 2005, and Barroso appeared before Parliament at a debate on 26 May 2005. The motion was heavily defeated. A Conservative MEP, Roger Helmer, was expelled from his group, the European People's Party – European Democrats (EPP-ED), in the middle of the debate by that group's leader Hans-Gert Pöttering as a result of his support for Farage's motion. After the speech of Herman Van Rompuy on 24 February 2010 to the European Parliament, Farage – to protests from other MEPs – addressed the former Belgian Prime Minister and first long-term President of the European Council saying that he had the "charisma of a damp rag and the appearance of low grade bank clerk". Farage questioned the legitimacy of Van Rompuy's appointment, asking, "Who are you? I'd never heard of you, nobody in Europe had ever heard of you." He also asserted that Van Rompuy's "intention [is] to be the quiet assassin of European democracy and of the European nation states". Van Rompuy commented afterwards, "There was one contribution that I can only hold in contempt, but I'm not going to comment further." After refusing to apologise for behaviour that was, in the words of the President of the European Parliament, Jerzy Buzek, "inappropriate, unparliamentary and insulting to the dignity of the House", Farage was reprimanded and had his right to ten days' allowance (expenses) "docked". I defend absolutely Mr Farage's right to disagree about the policy or institutions of the Union, but not to personally insult our guests in the European Parliament or the country from which they may come... I myself fought for free speech as the absolute cornerstone of a democratic society. But with freedom comes responsibility – in this case, to respect the dignity of others and of our institutions. I am disappointed by Mr Farage's behaviour, which sits ill with the great parliamentary tradition of his own country. I cannot accept this sort of behaviour in the European Parliament. I invited him to apologise, but he declined to do so. I have therefore – as an expression of the seriousness of the matter – rescinded his right to ten days' daily allowance as a Member. Questioned by Camilla Long of The Times, Farage described his speech: "it wasn't abusive, it was right." On 12 September 2006, Farage was elected leader of UKIP with 45 percent of the vote, 20 percentage points ahead of his nearest rival. He pledged to bring discipline to the party and to maximise UKIP's representation in local, parliamentary and other elections. In a PM programme interview on BBC Radio 4 that day he pledged to end the public perception of UKIP as a single-issue party and to work with allied politicians in the Better Off Out campaign, committing himself not to stand against the MPs who have signed up to that campaign. In his maiden speech to the UKIP conference, on 8 October 2006, Farage told delegates that the party was "at the centre-ground of British public opinion" and the "real voice of opposition". He said: "We've got three social democratic parties in Britain – Labour, Lib Dem and Conservative are virtually indistinguishable from each other on nearly all the main issues" and "you can't put a cigarette paper between them and that is why there are nine million people who don't vote now in general elections that did back in 1992." At 10pm on 19 October 2006, Farage took part in a three-hour live interview and phone-in with James Whale on the national radio station talkSPORT. Four days later, Whale announced on his show his intention to stand as UKIP's candidate in the 2008 London Mayoral Election. Farage said that Whale "not only has guts, but an understanding of what real people think". Whale later decided not to stand and UKIP was represented by Gerard Batten. Farage stood again for the UKIP leadership in 2010 (having stood down the year before, to focus on his unsuccessful campaign for the Buckingham seat) after his successor Lord Pearson had stood down, and on 5 November 2010 it was announced he had won the leadership contest. In May 2014, Farage led UKIP to win the European Parliament election with 4,376,635 votes, the first time a UK political party other than Labour or Conservatives had won a national election in over 100 years. Farage was returned as MEP for the South East region, a seat he has represented since 1999. As an MEP, Farage leads the Europe of Freedom and Direct Democracy grouping in the European Parliament. On 8 May 2015, Farage resigned as leader of UKIP after he failed to win the seat of Thanet South in the general election held the previous day, although he kept open the possibility of re-entering the ensuing leadership contest. On 11 May 2015, it was announced that Farage would continue to serve as the party's leader, with the BBC reporting: "Party chairman Steve Crowther said the national executive committee believed the election campaign had been a ‘great success’ and members had ‘unanimously’ rejected Mr Farage's letter of resignation". Interviewed about his continued leadership by the BBC the following day, Farage said: "I resigned. I said I'd resign. I turned up to the NEC meeting with letter in hand fully intending to carry that through. They unanimously said they didn't want me to do that, they presented me with petitions, signatures, statements from candidates saying it would be a bad thing for UKIP. So I left the meeting, went and sat in darkened room to think about what to do, and decided for the interest of the party I would accept their kind offer for me to stay and tear up the letter." He added that he would consider standing for parliament again should a by-election be called in a Labour-held seat. Farage resigned as UKIP leader on 4 July 2016 with the following comment: "During the [Brexit] referendum I said I wanted my country back ... now I want my life back" and added that this resignation was final: "I won’t be changing my mind again, I can promise you", apparently referring to his two previous resignations (in 2009 and 2015). Farage had unsuccessfully contested British parliamentary elections for UKIP five times, both before and after his election as an MEP in 1999. Under the 2002 European Union decision to forbid MEPs from holding a dual mandate, if he were to be elected to the House of Commons, he would have to resign his seat as MEP. When he contested the Bromley & Chislehurst constituency in a May 2006 by-election, following the death of Eurosceptic Conservative MP Eric Forth, Farage came third, winning 8 per cent of the vote, beating the Labour Party candidate. This was the second-best by-election result recorded by UKIP out of 25 results, and the first time since the Liverpool Walton by-election in 1991 that a party in government had been pushed into fourth place in a parliamentary by-election on mainland Britain. Charles, Prince of Wales was invited to speak to the European Parliament on 14 February 2008; in his speech he called for EU leadership in the battle against climate change. During the standing ovation that followed, Farage was the only MEP to remain seated, and he went on to describe the Prince's advisers as "naïve and foolish at best." Farage continued: "How can somebody like Prince Charles be allowed to come to the European Parliament at this time to announce he thinks it should have more powers? It would have been better for the country he wants to rule one day if he had stayed home and tried to persuade Gordon Brown to give the people the promised referendum on the Treaty of Lisbon." The leader of the UK Labour Party's MEPs, Gary Titley, accused Farage of anti-Royalism. Titley said: "I was embarrassed and disgusted when the Leader of the UK Independence Party, Nigel Farage, remained firmly seated during the lengthy standing ovation Prince Charles received. I had not realised Mr Farage's blind adherence to right-wing politics involved disloyalty and discourtesy to the Royal Family. He should be thoroughly ashamed of himself and should apologise to the British people he represents." In May 2009, The Observer reported a Foreign Press Association speech given by Farage in which he had said that over his period as a Member of the European Parliament he had received a total of £2 million of taxpayers' money in staff, travel, and other expenses. In response, Farage said that in future all UKIP MEPs would provide monthly expense details. On 4 September 2009, Farage resigned as the UKIP's leader to focus on his campaign to become Member of Parliament for Buckingham at Westminster in the 2010 general election. He later told The Times journalist Camilla Long that UKIP internal fights took up far too much time. Farage stood against sitting Buckingham MP, John Bercow, the newly elected Speaker of the House of Commons, despite the convention that the Speaker, as a political neutral, is not normally challenged in his or her bid for re-election by any of the major parties. Farage came third with 8,401 votes. Bercow was re-elected and in second place with 10,331 votes was John Stevens, a former Conservative MEP who campaigned as an independent accompanied by "Flipper the Dolphin" (a reference to MPs flipping second homes). On 6 May 2010, the morning of the election, Farage was travelling in a two-seater PZL-104 Wilga aircraft with a pro-UKIP banner attached, when the plane crashed. Farage suffered injuries that were described as non-life-threatening. Although his injuries were originally described as minor, his sternum and ribs were broken and his lung punctured. The Air Accidents Investigation Branch (AAIB) report said that the aeroplane was towing a banner, which caught in the tailplane, forcing the nose down. On 1 December 2010, Justin Adams, the pilot of the aircraft involved in the accident, was charged with threatening to kill Farage in a separate incident. He was also charged with threatening to kill an AAIB official involved in the investigation into the accident. In April 2011, the pilot was found guilty of making death threats. The judge said that the defendant was "clearly extremely disturbed" at the time the offences happened, adding "He is a man who does need help. If I can find a way of giving him help I will." UKIP forgot to put their party name on their candidate's ballot paper for the London mayoral election, 2012, Laurence Webb appearing as "a fresh choice for London". Farage described the mistake as an internal error. Interviewed the following Sunday by Andrew Neil and asked about "the game plan", Farage welcomed the "average 13% vote" across the country, and stated that the party was preparing for county council elections in 2013, European elections in 2014 and a general election in 2015. Asked what would happen to UKIP if the Conservatives made a manifesto commitment to a referendum on EU membership, Farage said they had already failed to honour a "cast iron" commitment to a referendum on the Lisbon Treaty. Challenging Farage's viewpoint, Neil said that UKIP aspired to come top of the European elections, but while UKIP wanted to join the big time they were still seen as "unprofessional, amateur and even unacceptable". In an interview, Farage described Baroness Warsi as "the lowest grade Chairman the Tory Party has ever had". He was voted politician of the year by the online service MSN. In May 2013, Farage led UKIP to its best performance in a UK election. The party received 23 per cent of the vote in the local elections, winning 147 council seats, and placing it only 2 points behind the governing Conservative Party and 9 points ahead of the Liberal Democrats. Farage was mobbed by well-wishers as he made his way to his favourite pub, the Marquis of Granby, for a celebratory drink. He called the victory "a real sea change in British politics". Subsequently, polling agency Survation found that 22 per cent of voters intended to support UKIP in the 2015 General Election. In May 2013, Farage was interrupted by protesters during a press conference in the Canon's Gait pub on Edinburgh's Royal Mile. The demonstration was organised by groups including the Radical Independence Campaign and saw protesters vocally accuse Farage of being "racist", "fascist", and a "homophobe", and tell him to "go back to London". Farage made attempts to leave by taxi but was prevented from doing so, and was eventually taken away in an armoured police van while protesters continued to shout. He was trying to raise the profile of UKIP in Scotland ahead of the Aberdeen Donside by-election; the party at that point had no representation in the country, and took 0.91 per cent of the vote in the previous election though it won its first Scottish MEP the following year. During an interview with BBC's Good Morning Scotland radio show, Farage described the protesters as "yobbo fascist scum" before hanging up, stating that the questions regarding the incident in Edinburgh were insulting and unpleasant. In a second visit to Edinburgh in May 2014 Farage correctly predicted that UKIP would win a Scottish seat in the European Parliament elections. Two hundred protesters heckled and booed him. Thirty police in two vans were needed to preserve order. In the European Parliament elections in 2014, Farage led UKIP to win the highest share of the vote. It was the first time a political party other than the Labour Party and Conservative Party had won the popular vote in a national election since the 1906 general election. It was also the first time a party other than the Labour and Conservatives won the largest number of seats in a national election since the December 1910 general election. In June 2014, Farage declared £205,603 for gifts over 10 years, including free use of a barn for his constituency office, which had been declared in the EU register in Brussels each year. The Electoral Commission said that the gifts should have been also declared in the UK within 30 days of receipt and fined Farage £200. In October 2013, Farage announced on the BBC's The Andrew Marr Show that he would stand for election as an MP at the United Kingdom general election, 2015, most likely contesting either Folkestone and Hythe or South Thanet; meanwhile he stated that his duty and preference was to focus on his current role as an MEP. In August 2014, Farage was selected as the UKIP candidate for South Thanet following local hustings. On 12 September 2014, he appeared at a pro-union rally with Scottish UKIP MEP David Coburn ahead of Scotland's independence referendum. In October 2014, Farage was invited to take part in prospective Leaders' debates on BBC, ITV, Channel 4 and Sky ahead of the 2015 General Election. UKIP indicated that it would consider taking legal action were the party excluded, in contravention of established broadcast media rules, from televised Party Leaders' debates in advance of the 2015 General Election. The 7-way Leaders' TV debate was broadcast by ITV on 2 April 2015 from MediaCityUK, Salford Quays. Of three polls taken immediately afterwards, the ComRes poll had Farage as joint winner, alongside Labour's Ed Miliband and Conservative David Cameron. In March 2015, Farage declared in his book The Purple Revolution that he would step down as UKIP leader should he not be elected as an MP; he stated his belief that it would not be "credible" for him to lead UKIP without sitting in parliament at Westminster. On 22 March 2015, Farage was targeted by anti-UKIP activists who chased him and his family from a pub lunch in Downe, Kent. His daughters ran away to hide and were later found to be safe. Farage, when asked what he thought about the incident, called the protesters "scum". Farage was unsuccessful in his bid to become MP for South Thanet although he came second (beating Labour by over 4,000 votes), reduced the Conservative majority to less than 3,000, and gained over 32% of the vote. He subsequently announced his resignation as the leader of UKIP, citing that he is a "man of his word" since he promised to resign if he did not win his seat. However, on 11 May 2015, the party chairman said they would not accept Mr Farage's post-election resignation because the party's "election campaign had been a great success". A row subsequently developed within the party, in which MEP and campaign chief Patrick O'Flynn described Farage's public image as "snarling, thin-skinned, aggressive" and said he risked turning the party into a "personality cult". O'Flynn accused Farage of paying too much attention to advisors that "would like to take UKIP in the direction of some hard-right, ultra-aggressive American Tea Party-type movement", singling out the NHS and gun control liberalisation as particular issues. Raheem Kassam, Farage's chief of staff and editor of Breitbart London was later sacked as a result, whilst O'Flynn stated that he continued to support Farage as party leader. Farage also faced a number of calls from senior figures within the party to stand down. Following the election a UKIP spokesman acknowledged that after a series of threatening attacks on Farage it had sent an informant into the Thanet branch of the protest organisation Stand Up to UKIP, stating "in order to provide reasonable security it was of course necessary to have information from the inside", an approach he said was used by "a great many security operations tasked with protecting the safety and wellbeing of a targeted individual". According to The Guardian, the informant is alleged to have actively encouraged members to commit criminal damage. Farage had said he was the victim of "trade union-funded activists" who were inciting vandalism. In January 2016, Farage told The Mail on Sunday that he believed his car had been tampered with in October 2015, as he had been forced to stop when his car's wheel nuts came loose. He reported that he had spoken with the French police but did not wish to pursue the matter any further. The Times, however, said Farage's story was untrue, and that Dunkirk prosecutors had no reason to suspect foul play or the police would have started an investigation. The owner of the breakdown garage concerned had said the problem was probably shoddy repair work, but he had been unable to communicate directly with Farage. Farage later said he had made a "terrible, terrible mistake" in speaking to journalists and that a Sunday newspaper had misreported his claims of tampering as an assassination attempt. Farage said in 2013 that he had hired a tax advisor to set up the Farage Family Educational Trust 1654, a trust that Farage said was used "for inheritance purposes", on the Isle of Man. Farage later described this "as standard practice", but stated he "decided I didn't want it. I never ever used it. The Isle of Man is not a tax haven." Farage has since said that this was a mistake, in part because it cost him too much money, but has criticised the political discourse surrounding tax avoidance as a "race to the bottom". The BBC reported that "The Isle of Man was one of the UK's crown dependencies which signed an agreement on corporate disclosure at a recent meeting with David Cameron amid claims that individuals and firms are using offshore locations to reduce their tax liabilities", adding that the Isle of Man rejects any allegations that they are used for the purpose of tax avoidance. Farage had previously denounced tax avoidance in a speech to the European Parliament, in which he criticised European bureaucrats who earned £100,000 a year and paid 12 per cent tax under EU rules, Farage said in 2014 that most legal tax avoidance was "okay" after he was questioned on why £45,000 of his income was paid into his private company rather than a personal bank account, saying that criticism of his actions was "ridiculous". 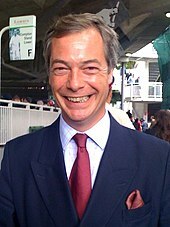 In the wake of the Panama Papers leak, Farage said that the possibility of him releasing his tax return was a "big no" as "I think in this country what people earn is regarded as a private matter", and criticised David Cameron as hypocritical, especially with regard to his past comments about Jimmy Carr's tax avoidance. Farage has continued to have fees paid to him via a limited company, Thorn in the Side Ltd, which may reduce his tax liabilities. Although he was a member of the European Parliament, Farage campaigned to leave the EU as a key figurehead for the British exit from the EU in 2016. Polls on the day of the vote suggested defeat for the leave campaign, though they were successful with 52 per cent of the vote. Jean-Claude Juncker promptly told all UKIP members to leave the Parliament. Farage also made the suggestion of a future second referendum in an interview with the Daily Mirror if Brexit lost but the result was closer than 52-48. On 28 June 2016, Farage made a speech in the European Parliament in which he stated that a hypothetical failure for the EU to forge a trade deal with an exiting UK would "be far worse for you than it would be for us", to heckling and laughing by Parliament members. He insulted his fellow MEPs, stating that "virtually none" of them had ever had done "a proper job" in their lives. Media around the world covered Farage's speech, including his comment: "... when I came here 17 years ago, and I said that I wanted to lead a campaign to get Britain to leave the European Union, you all laughed at me. Well I have to say, you're not laughing now are you?" and his prediction that Britain will not be the only country to leave the EU. In response, Guy Verhofstadt compared Farage's referendum posters with Nazi propaganda and credited the Brexit campaign with causing a multi-billion loss in the stock exchange. Explicitly addressing Farage, Verhofstadt added, "... Ok. Let's be positive. Finally, we're going to get rid of the biggest waste in the budget of the (European) Union, that we have paid for 17 years, your salary." Farage resigned as leader of the United Kingdom Independence Party on 4 July 2016, saying that: "It's right that I should now stand aside as leader. What I said during the referendum campaign is I want my country back. What I'm saying today is I want my life back. And it begins right now" and "I have never been, and I have never wanted to be, a career politician." Jean-Claude Juncker, President of the European Commission, described Farage as a "retro-nationalist", Caroline Lucas, Green Party MP for Brighton Pavilion, said that his legacy is "toxic and unforgivable" and that "He has used his position to whip up hatred against migrants and divert attention from the real challenges this country is facing", and former Labour Party leader, Ed Miliband, said: "It's a legacy of stirring up division. I am not sorry to see Nigel Farage leave the political scene". Paul Nuttall, a UKIP MEP, tweeted that Farage's "drive and belief shook establishment politics to its core and gave us a voice" and Suzanne Evans, former Deputy Chairman of UKIP, said that Farage's resignation surprised her, but "there is room still in Britain for UKIP". Writing in The Spectator, after this resignation when it was thought he was leaving politics, the journalist Rod Liddle described Farage as: "The most important British politician of the last decade and the most successful. His resignation leaves a hole in our political system. With enormous intelligence and chutzpah and a refreshingly unorthodox approach, he built UKIP up from nothing to become established as our third largest party and succeeded in his overriding ambition – to see the UK vote to leave the European Union." Following a legal challenge to the use of the Royal Prerogative to invoke article 50, Farage appeared on television with Gina Miller. Miller stated that "politicians had lied all the way through" and the Referendum act clearly said that the result was advisory. Farage also agreed that it was advisory. Farage was appearing on The Andrew Marr Show. Farage talked of a peaceful protest and warned of unprecedented political anger if Parliament blocked Brexit. Miller said that parliamentary democracy required parliament to debate issues and that Farage had spent the whole Brexit campaign arguing for parliamentary sovereignty. Calling his warnings "the politics of the gutter", Tim Farron said the British judges had merely interpreted British law and that fortunately Farage was the only person talking about taking to the streets. Miller has previously called Farage irresponsible and has blamed him and the tabloid media for death threats against her. She stated in November 2016 that she would not take legal action against those who had threatened her. On 7 November 2016, Farage announced he would lead a 100,000 strong march to the Supreme court timed for when it starts hearing the Government appeal. On 27 November 2016, it was reported the march was being cancelled out of concerns it could be hijacked by the far-right groups English Defence League and the British National Party. The next day, Paul Nuttall became the new UKIP party leader after Farage decided to step aside to strengthen his relationship with US President-elect Donald Trump. Farage has argued strongly in favour of a British Independence Day being observed within the United Kingdom, on 23 June each year. On 24 June 2016, in a televised speech on the morning of the Brexit result, he stated; "let June 23rd go down in our history as our Independence Day", and later said that it "must now be made a national holiday." In 2017, Farage called for the departure of UKIP's only MP, Douglas Carswell. He said in The Daily Telegraph: "I think there is little future for UKIP with him staying inside this party. The time for him to go is now." There was reportedly controversy within the party over whether Carswell had tried to prevent Farage receiving a knighthood. It was reported the MP had suggested Farage should instead be given an OBE "for services to headline writers". On 20 April 2017, Farage announced that he would not contest the 2017 general election. He said that he believed he could further advance his version of Brexit as a leader of a group in the European Parliament. In May 2018, Farage addressed a fundraising event for the Democratic Unionist Party, with his main financial backer, Arron Banks, who accompanied Farage during the event, stating that he would support a bid by Farage to seek office as a DUP candidate after the end of his tenure as Member of the European Parliament in 2019. In August 2018, Farage pledged his "absolute and total support" to the pro-Brexit organisation Leave Means Leave, and subsequently announced that he would be returning to full-time campaigning for "the Brexit that people voted for". Shortly after the announcement, he was made a Vice Chairman of the group. On 4 December 2018, Farage announced "with a heavy heart" on his live LBC radio show that effective immediately he had resigned his membership of UKIP, after 25 years as a member of the party. In explanation, Farage mentioned UKIP leader Gerard Batten's appointment the previous month of far-right activist Tommy Robinson as an adviser and the National Executive of UKIP's voting in a no-confidence vote to keep Batten as leader of the party. Farage argued that Batten was "obsessed with the issue of Islam, not just Islamic extremism, but Islam, and UKIP wasn't founded to be a party fighting a religious crusade." He also said that association with Robinson damaged the image of Brexit. On 8 February 2019, Reuters noted that the Brexit Party has been approved by the Electoral Commission and quoted Farage from an article he wrote in The Telegraph, stating that he would stand as a candidate for The Brexit Party in any potential future European Parliament elections contested in the United Kingdom. On 8 February 2019, the Financial Times quoted Farage as saying that the new party was a "live vehicle" that could be "mobilised" if Brexit is delayed. On 13 February, Farage confirmed on his Twitter account that he would now sit in the European Parliament as a member of the Brexit Party. On 22 March, Farage was officially announced as the new Leader of the Brexit Party after founder and former Leader Catherine Blaiklock resigned due to her discovered anti-Islam social media history. Farage speaking at the 2015 Conservative Political Action Conference (CPAC) in Washington, D.C. about the American elections. In a May 2016 interview with Robert Peston, Farage said that, whilst he had reservations on the views and character of 2016 Republican presidential candidate Donald Trump, if he were an eligible US voter he would vote for Trump in 2016 presidential election, to prevent Hillary Clinton becoming president. In July 2016, Farage visited the Republican convention in Cleveland with his aide and office manager George Cottrell. Both Farage and Cottrell appeared on American television and engaged in discussions with Trump's aides before Cottrell was arrested by the FBI on 21 federal counts of fraud, money laundering and extortion. Farage "was unaware of Cottrell's alleged illegal activities and his arrest by the FBI came as a shock." Cottrell's arrest left Farage unable to access his personal diary. Cottrell ultimately pleaded guilty to one count of wire fraud as part of a plea agreement with U.S. federal prosecutors and was sentenced to eight months in U.S. federal prison and was fined $30,000; the crime had been committed before Cottrell joined UKIP. In August 2016, Farage and fellow Brexiteers Andy Wigmore and Arron Banks met Trump for the first time at a high-dollar campaign fundraiser in Jackson, Mississippi. They were invited to the event by staffers for Mississippi governor Phil Bryant while attending the GOP convention. Afterwards, Trump invited them to his campaign rally that night. Trump asked Farage to speak at the rally and introduced him to the crowd as "Mr. Brexit". In October 2016, Farage praised Trump for "dominating" Hillary Clinton, comparing him to a silverback gorilla. Following revelations of a 2005 audio recording in which Trump made lewd remarks about women, Farage said that Trump's comments were "ugly" but described them as "alpha male boasting" and stated that women also made remarks they would not want to see reported. Farage's comments prompted several senior UKIP members to express concern privately, and prompted public condemnation of Farage from two UKIP MEPs, Jane Collins and William Dartmouth. As more publicity appeared about Trump's alleged groping and as the criticisms increased, Farage said he disagreed with Trump's comments about groping women and his comments on Muslim immigration. Farage is reported to have had close links with Trump's chief strategist, Steve Bannon, since at least 2014, when Bannon scheduled meetings for Farage with right-wing figures in Washington. In his book, The Purple Revolution: The Year That Changed Everything, Farage described Bannon as "my sort of chap." After Trump's victory, Farage said that he "couldn't be happier" and in the same interview referred to outgoing president Barack Obama a "loathsome individual" and "that Obama creature", remarks which prompted criticism. Labour MP John Woodcock criticised Farage's comments, saying they had "clear racist undertones." Farage was the first British politician to speak to Trump after his election, meeting with Trump in his eponymous Manhattan tower. In November 2016, after becoming president-elect, Trump publicly suggested, via Twitter post, that the UK government name Farage as British ambassador to the United States. Trump's expression of a preference for a foreign nation's ambassador was "a startling break with diplomatic protocol" that was unprecedented in recent US history. The British government rejected the suggestion, with a Downing Street spokesman and Foreign Secretary Boris Johnson stressing that there was no vacancy in the position. On 20 January 2017, the day of Trump's presidential inauguration, US news channel Fox News announced it had hired Farage as a commentator. He has since provided political analysis for both the main Fox News channel and its sister channel Fox Business Network. Farage also began hosting a talk show on the British radio station LBC for four nights a week. In October 2017, Farage asserted in an LBC radio appearance that the "Jewish lobby" in the United States was more concerning to him than Russian interference in American politics, saying: "There are other very powerful lobbies in the United States of America, and the Jewish lobby, with its links with the Israeli government, is one of those strong voices...There are about 6 million Jewish people living in America, so as a percentage it's quite small, but in terms of influence it's quite big." Farage's remarks were condemned by the Campaign Against Antisemitism and the Anti-Defamation League, which said that Farage's comment "plays into deep-seated anti-Semitic tropes" and was fuel for extremist conspiracy theories. Farage endorsed Roy Moore in the United States Senate special election in Alabama. After numerous allegations of sexual misconduct were made against Moore, Farage publicly expressed his scepticism over the allegations. In May 2018, he expressed regret for having backed Moore, stating, "I should have thought about the whole thing far more deeply than I did, and it was a mistake." In July 2018, Farage headlined a fundraiser for Lou Barletta, the Republican nominee in the 2018 United States Senate election in Pennsylvania. Since April 2018, Farage has been a strong advocate for U.S. President Donald Trump to receive the Nobel Peace Prize on the basis of his attempt to bring better diplomatic relations between North Korea and South Korea as well as better diplomatic relations between North Korea and the United States. As a member of the European Parliament, Farage expressed his desire to begin an official petition for Trump to receive the award. During the 2016 Austrian presidential election campaign, Farage said that Norbert Hofer, the Freedom Party candidate, would call for a "Brexit style referendum" if he won. Hofer, however, ruled out a referendum and asked Farage not to interfere in Austria's internal politics. Farage initially endorsed Nicolas Dupont-Aignan of Debout la France, another party of the Alliance for Direct Democracy in Europe, and later supported Marine Le Pen of the National Front, for the second round of the 2017 French presidential election. Farage said that the basis for his endorsement of Le Pen was his belief that she would be more sympathetic to the UK following Brexit, in contrast to the pro-European Emmanuel Macron. From taking office as a UKIP MEP in 1999, Farage has often voiced opposition to the "euro project". His argument is that "a one-size-fits-all interest rate" cannot work for countries with structurally different economies, often using the example of Greece and Germany to emphasise contrast. Farage strongly opposes the use of bailouts and says that "buying your own debt with taxpayers' money" will not solve the problem and that, "if we do, the next debt crisis won't be a country ... it will be the European Central Bank itself". On the issue of welfare, Farage wants migrants to live in the UK for five years before being able to claim benefits, and for them to be ineligible for tax credits. He believes that tax avoidance is caused by "punitive tax rates", and wants "fairer" taxes as a way to prevent it. Farage declared himself in favour of the Alternative Vote system of May 2011, saying first-past-the-post would be a "nightmare" for UKIP. The party's stance has to be decided by its central policy-making committee, although Farage has expressed a preference for the AV+ system as it "would retain the constituency link and then also the second ballot ensured there were no wasted votes". After the 2015 general election, in which UKIP took a lower proportion of seats than votes, Farage called the first-past-the-post voting system (FPTP) "totally bankrupt", although Farage said: "I completely lost faith in [FPTP] in 2005 when Blair was returned with a 60 seat majority on 36 per cent of the vote, or 22 per cent if you factor in low turnout." In 2013, Farage criticised David Cameron's policy on wind turbines, describing it as covering "Britain in ugly disgusting ghastly windmills". An official energy policy document produced by UKIP while Farage was leader of the party stated that "UKIP strongly supports a clean environment and clean air, stressing that "coal-fired power stations must use clean technology to remove sulphur and nitrogen oxides, particulates and other pollutants". In a speech made to the European parliament on 11 September 2013, Farage cited news, reported in several Rupert Murdoch-owned papers and the Daily Mail, that the Arctic Sea ice cap had apparently grown from 2012 to 2013, saying that this was evidence of decades "of Euro-federalism combined with an increasing Green obsession". Farage takes an anti-prohibitionist position on recreational drugs. In an April 2014 phone-in interview hosted by The Daily Telegraph he argued that the War on Drugs had been lost "many, many years ago", stating that "I hate drugs, I've never taken them myself, I hope I never do, but I just have a feeling that the criminalisation of all these drugs is actually not really helping British society." He argued in favour of a Royal Commission on drugs, which would explore all avenues as to how to legislate most effectively and deal with their related criminal and public health problems, including the possibility of their legalisation. According to Farage, the smoking ban in enclosed public spaces is "silly and illiberal"; he recommends separate smoking areas along the lines of some German states. He believes that banning things makes them more attractive to children, and said that "Obesity is killing more people than smoking, you could ban chip shops, you could ban doughnuts. The point is we are big enough and ugly enough to make our own decisions". In his 2015 book, Farage reflected that based on his experiences, "the NHS is so over-stretched that if you can afford private health care, you should take it, particularly for diagnostics and preventative medicine. In the NHS, the system is so battered and poorly run that unless you are really lucky, you will fall through the cracks. The NHS is, however, astonishingly good at critical care. But what testicular cancer taught me is that the NHS will probably let you down if you need screening, fast diagnosis and an operation at a time that suits you". He supports reform within the NHS, saying that its resources have become stretched due to increased immigration, and blaming Labour for high costs of new hospitals built through private finance initiatives. Farage says that money which the NHS could spend on treating taxpayers with serious conditions is instead spent on recent immigrants with HIV, an opinion which has been controversial. A YouGov poll found 50 per cent of those taking part to support Farage, with 37 per cent saying that he is scaremongering. Farage has said that he supports Muslim immigrants who integrate to British society, but is against those who are "coming here to take us over", citing John Howard's Australia as a government to emulate in that regard. He told a Channel 4 documentary in 2015 that there is a "fifth column" of Islamic extremists in the United Kingdom. Farage has said that the "basic principle" of Enoch Powell's "Rivers of Blood speech" was correct. In a 2014 interview on the LBC radio station, Farage said that he would feel "concerned" if a group of Romanian men moved next door to him. When interviewer James O'Brien inquired what would be the difference between Romanian men moving next door and a group of German children, in reference to Farage's German wife and children, Farage replied: "You know the difference." He later expanded on this on the UKIP website, explaining that "if we were able to operate a proper work permit scheme for Romanian nationals, with suitable checks, as recommended by UKIP, then nobody would need to be concerned if a group of Romanian nationals moved in next door to them." Farage called on the British government in 2013 to accept more refugees from the Syrian Civil War. He later clarified that those refugees should be of the country's Christian minority, due to the existence of nearer Muslim-majority safe countries. During the ensuing migration crisis, Farage alleged that the majority of people claiming to be refugees were economic migrants, and that some were Islamic State militants. Farage is in favour of crackdowns on immigration from Eastern Europe, but is favourable to immigration from India and Australia. Farage is critical of Britain's involvement in the wars in Iraq, Afghanistan and Libya, and cited their financial and human expenses and poor outcomes as reasons for Britain to not become involved militarily in Syria. He has expressed fears that rebel forces in Syria may be Islamic extremists. He said about the wars in Iraq and Afghanistan that "Nobody should forget that the most devastating direct consequences of the wars in Iraq and Afghanistan have not been suffered by the likes of Mr Blair, but by the civilian populations of these countries and of course by our own brave service personnel". Farage stated that migrant exodus from Libya had been caused by NATO military intervention, approved by David Cameron and Nicolas Sarkozy, in the civil war in Libya. Farage has criticised Britain's close ties with Saudi Arabia. He said: "I think we need a complete re-appraisal of who Saudi Arabia are, what our relationship with them is, and stop extremist talk turning the minds of young, male Muslims in this country." When asked in 2014 which leaders he admired, Farage said, "As an operator, but not as a human being, I would say Putin. The way he played the whole Syria thing. Brilliant. Not that I approve of him politically. How many journalists in jail now?" Farage has criticised what he sees as EU militarism agitating western Ukrainians against Russia. Later, in 2015, he said about Putin that "The European Union, and the West, view Putin as the devil. They want to view Putin as the devil. I’m not saying I want take him around for tea and meet mum on Sunday afternoon … But the point is, on this bigger overall battle [against ISIS in Syria] we need to start recognizing we’re on the same side". Farage's stance on Iran has shifted over time. In 2013, Farage opposed sanctions on Iran, and criticised a potential Israeli strike on Iranian nuclear facilities, stating: "I do not support acts of aggression, even from countries that feel their existence is threatened". In 2018, he condemned Jeremy Corbyn's "record for standing up and defending this hardline Islamist regime" and declared that regime change was "absolutely the right thing" in Iran. In May 2012, Farage was interviewed by Karen Coleman of the Irish Independent about the campaign in Ireland against the Irish fiscal treaty. Ireland had no anti-EU MEPs and according to Pat "the Cope" Gallagher MEP, UKIP's involvement was counterproductive as "Irish voters strongly dislike foreigners like Mr Farage telling them how to vote." Coleman who believed the campaign had "little to do with what's best for Ireland" described the campaign as "particularly egregious" and said the interview became 'nasty' when she asked Farage about the campaign funding. In 2014, Farage said that it is UKIP policy for handguns in the UK to be legalised and licensed, describing the current legislation, brought in after the Dunblane school massacre, as "ludicrous". He has also said that there was no link between responsible handgun ownership and gun crime. Since January 2017, Farage has hosted The Nigel Farage Show on the UK radio station LBC. The show is broadcast live on Mondays to Thursdays from 6 pm to 7 pm. Also, since September 2017, Farage has hosted an additional new show on LBC, The Nigel Farage Show On Sunday, which is broadcast live every Sunday from 10 am to 12 pm noon. Although it is primarily an audio-only radio presentation, the show can also be watched from a television-style visual perspective with Farage appearing live on-screen via a set of camera's within the LBC studio. This way of watching the programme is available (officially) via LBC's YouTube channel, LBC's Facebook page, LBC's Twitter feed as well as LBC's Periscope account during the time the show is live on-air. These live streams usually attract large audiences (occasionally into the tens of thousands on all platforms combined) as the weekday shows begin when people get home after the 9-5 working day and it is also during early peak time. Thus, the weekday editions of The Nigel Farage Show has become one of the most popular shows on LBC. However, the Sunday version of the show (despite the same format) has always received lower viewership than that of its weekday editions. From March 2018 to July 2018, Farage hosted a podcast under the LBC banner entitled Farage Against The Machine, a play on words for the term 'rage against the machine', where he discussed the latest political developments and political news with political figures who Farage both agrees, and disagrees with. New episodes of the podcast were released every Friday, but the podcast was cancelled after the American rock music band Rage Against the Machine sent a cease and desist letter to Farage, demanding that Farage change the name of the podcast, which he was unwilling to do, prompting LBC to reluctantly trigger it's cancellation. All episodes are on LBC.co.uk and iTunes. Farage lives in Single Street, a hamlet in the London Borough of Bromley, "around the corner from his mother". He has been married twice. In 1988, he married Irish nurse Gráinne Hayes, with whom he has two children: Samuel (born 1989) and Thomas (born 1991). The couple divorced in 1997. In 1999, he married Kirsten Mehr, a German national; the couple have two children. His wife told the Press Association in February 2017 that the couple were living "separate lives" and Farage "moved out of the family home a while ago". He has spoken of how his children have been teased because of their relation to him. In a BBC interview with Rachel Johnson in May 2017 he described himself as "53, separated, skint [broke]", citing 20 years of campaigning as the reason for both. He has made reference to his German wife in response to criticisms that he is somehow "anti-Europe", while he himself says he is merely anti-EU. Farage has employed his wife as his parliamentary secretary and in April 2014 he said that "nobody else could do that job". On 25 November 1985, Farage was hit by a car after a night out, and suffered injury to his head and left leg, the latter nearly requiring amputation. He was in casts for 11 months, but recovered, and the nurse who treated him became his first wife. On 26 December 1986, Farage first felt symptoms of what was later discovered to be testicular cancer. He had the left testicle removed, and the cancer had not spread to any other organs. In 2010, Farage published a memoir, entitled Fighting Bull (Flying Free in paperback), outlining the founding of UKIP and his personal and political life so far. A second book, The Purple Revolution: The Year That Changed Everything, was released by Biteback Publishing in 2015. Farage is also a keen cricket fan and has appeared on Test Match Special. He appeared in an advertisement for the bookmaker Paddy Power ahead of golf's 2014 Ryder Cup. However, due to spinal injuries since his 2010 plane crash, he cannot play golf. Farage is also an association football fan, and supports Crystal Palace FC. He likes to relax by fishing alone at night on the Kent coast. Farage is a smoker and also fond of beer, this forming part of his public image. Farage is a member of the East India, Devonshire, Sports and Public Schools' Club, a gentlemen's club situated in St. James's Square in London. Farage is a Christian. In 2014 he described himself as a "somewhat lapsed" member of the Church of England. In April 2018, Farage said that his two youngest children have both British and German passports and that they speak "perfect German". ^ a b Farage, Nigel (4 December 2018). "With a heavy heart, I am leaving Ukip. It is not the Brexit party our nation so badly needs". The Daily Telegraph. ^ Hunt, Alex (21 November 2014). "UKIP: The story of the UK Independence Party's rise". BBC News. Archived from the original on 12 December 2016. ^ While Farage himself pronounces it thus, he has stated that he does not mind if the alternative pronunciation of /ˈfærɪdʒ/ is used by others – Farage vs Paxman,[dead link] Newsnight (YouTube – UKIP webmaster's channel), 18 April 2010. Retrieved 13 May 2013. ^ "Phone Farage – Special Shows – Radio". LBC. Archived from the original on 17 February 2017. Retrieved 2 March 2017. ^ a b "Nigel Farage hired by Fox News as a political analyst". BBC. 20 January 2017. Archived from the original on 20 January 2017. Retrieved 21 January 2017. ^ Smith, Norman (5 October 2016). "Nigel Farage steps back in at UKIP as Diane James quits". BBC News. Archived from the original on 1 February 2017. Retrieved 5 October 2016. ^ "UKIP's alliance in Europe rescued by Polish MEP". BBC News. 20 October 2014. Archived from the original on 14 June 2015. Retrieved 6 March 2015. ^ Waterfield, Bruno (25 February 2010). "Ukip's Nigel Farage faces reprimand after calling Herman Van Rompuy 'wet rag'". The Daily Telegraph. London. Archived from the original on 6 January 2016. ^ a b Adams, Tim (21 July 2012). "Nigel Farage: I was never scared of being out on a limb". The Guardian. London. Archived from the original on 14 October 2012. ^ Goldsmith, Rosie (4 December 2012). "Profile: Nigel Farage, UKIP leader". BBC News. Archived from the original on 21 September 2013. ^ a b Sparrow, Andrew (3 September 2010). "Nigel Farage to stand for Ukip leadership again". The Guardian. London. Archived from the original on 27 September 2013. ^ a b Bennett, Asa (24 June 2016). "Nigel Farage has earned his place in history as the man who led Britain out of the EU". The Daily Telegraph. Archived from the original on 27 June 2016. Retrieved 24 June 2016. ^ a b "UKIP leader Nigel Farage stands down". BBC News. 4 July 2016. Archived from the original on 4 July 2016. ^ "Nigel Farage steps back in at UKIP as Diane James quits". BBC news. 5 October 2016. Archived from the original on 1 February 2017. Retrieved 18 October 2016. ^ Dale, Iain (2 October 2013). "Top 100 most influential Right-wingers". The Daily Telegraph. London. Archived from the original on 18 April 2016. Retrieved 4 May 2016. ^ Lejeune, Tristan (20 January 2017). "Fox News signs Nigel Farage, backer of Trump and Brexit". TheHill. Archived from the original on 19 May 2017. Retrieved 21 June 2017. ^ Farage, Nigel (17 August 2018). "The time has come to teach the political class a lesson: I'm back fighting for a real Brexit". The Telegraph. ^ "Former leader Nigel Farage quits UKIP". BBC News. 4 December 2018. Retrieved 4 December 2018. ^ a b "I am now sitting as an MEP for The Brexit Party in the European Parliament". Nigel Farage. 13 February 2019. Retrieved 13 February 2019. ^ a b "Nigel Farage back in frontline politics as Brexit Party leader". BBC News. 22 March 2019. Retrieved 24 March 2019. ^ a b c d Goldsmith, Rosie (4 December 2012). "Profile: Nigel Farage, UKIP leader". BBC News. Archived from the original on 19 April 2013. Retrieved 1 March 2013. ^ a b Durkin, Martin (30 March 2014). "My six months with normal Nigel Farage". The Daily Telegraph. London. Archived from the original on 31 March 2014. ^ a b c d e 'FARAGE, Nigel Paul', Who's Who 2012, A & C Black, 2012; online edn, Oxford University Press, Dec 2011; online edn, November 2011. Retrieved 22 July 2012. ^ Meltzer, Tom (10 May 2013). "Is Nigel Farage a racist?". The Guardian. London. Archived from the original on 30 July 2013. Retrieved 28 April 2014. ^ https://www.ancestry.co.uk/family-tree/person/tree/71196812/person/402068924020/facts Retrieved April 19 2019. ^ Dassanayake, Dion (3 May 2013). "Great-grandfather of Ukip leader Nigel Farage 'was born to German immigrants'". Daily Express. London. Archived from the original on 31 October 2013. ^ "Leader profile: 24 hours with Nigel Farage". BBC News. 4 December 2012. Archived from the original on 6 March 2015. Retrieved 6 March 2015. ^ a b Absolute Radio (17 April 2015). "Nigel Farage on Absolute Radio: Full Interview". YouTube. Google. Archived from the original on 19 October 2015. Retrieved 28 April 2015. ^ "Nigel Farage schooldays letter reveals concerns over fascism". Channel 4. Chennel 4. 19 September 2013. Archived from the original on 2 August 2017. ^ "Profile: Nigel Farage". BBC News. 12 September 2006. Archived from the original on 19 April 2013. Retrieved 24 February 2013. ^ "Question Time: This week's panel". 28 March 2007. Archived from the original on 31 August 2007. Retrieved 24 February 2013. ^ Watts, Robert (11 March 2007). "Making plans with Nigel". The Sunday Telegraph. London. Archived from the original on 6 June 2008. ^ "NIGEL FARAGE". 19 May 2016. Archived from the original on 5 June 2016. Retrieved 26 June 2016. ^ "Profile: Jacques Barrot". BBC News. 22 November 2004. Archived from the original on 29 May 2012. Retrieved 8 June 2009. ^ The prohibition contained in the French penal code against mentioning crimes covered by an amnesty only concerns French officials who may hear of such crimes in the course of their duties (CP L133-11), and does not apply generally (L133-10). ^ "MEP Nigel Farage replies to Parliament President Josep Borrell". 18 November 2004. Archived from the original on 10 September 2013. Retrieved 22 November 2011. ^ Neuger, James G. (25 May 2005). "Barroso Fights No-Confidence Vote Amid French Treaty Debate". Bloomberg L.P. New York. Archived from the original on 16 November 2006. Retrieved 8 June 2009. ^ "Barroso rebuffs yacht questions". BBC News. 25 May 2005. Archived from the original on 16 November 2006. Retrieved 8 June 2009. ^ a b c "Tirade against 'damp rag' EU president shocks MEPs". BBC News. 24 February 2010. Archived from the original on 25 February 2010. Retrieved 24 February 2010. ^ "Nigel Farage harangues EU President Herman van Rompuy". EUX.TV. YouTube. 24 February 2010. Archived from the original on 9 March 2010. Retrieved 27 February 2010. ^ "MEP Nigel Farage fined over 'insulting' tirade". BBC News. 2 March 2010. Archived from the original on 4 March 2010. Retrieved 21 March 2010. ^ a b "EP President Jerzy BUZEK on MEP Nigel FARAGE – 68659". European Parliament. 3 March 2010. Archived from the original on 7 March 2010. Retrieved 21 March 2010. ^ "Nigel Farage is the new Leader of the UK Independence Party" (Press release). UKIP. 12 September 2006. Archived from the original on 13 October 2006. ^ Wheeler, Brian (5 December 2006). "UKIP leader 'offered Tory seat'". BBC News. Archived from the original on 6 December 2006. Retrieved 12 October 2013. ^ "UKIP 'voice of British majority'". BBC News. 7 October 2006. Archived from the original on 19 September 2013. ^ Barnett, Ruth (5 November 2010). "Nigel Farage Re-Elected UKIP Party Leader". Sky News. Archived from the original on 12 October 2012. Retrieved 22 November 2011. ^ "Vote 2014 Election Results for the EU Parliament UK regions – BBC News". bbc.co.uk. Archived from the original on 11 May 2017. ^ "Members". efdgroup.eu. Archived from the original on 17 March 2015. Retrieved 2 April 2015. ^ "Nigel Farage resigns as UKIP leader". BBC News. 8 May 2015. Archived from the original on 11 May 2015. Retrieved 11 May 2015. ^ "Farage stays as UKIP leader after resignation rejected". BBC News. 11 May 2015. Archived from the original on 11 May 2015. Retrieved 11 May 2015. ^ "Nigel Farage hints at Labour by-election". BBC News. 12 May 2015. Archived from the original on 13 May 2015. Retrieved 12 May 2015. ^ Mason, Rowena (4 July 2016). "Nigel Farage resigns as Ukip leader after 'achieving political ambition' of Brexit". The Guardian. London, UK. Archived from the original on 5 July 2016. Retrieved 4 July 2016. ^ Kennedy, Simon (4 July 2016). "Farage Resigns as UKIP Leader After Brexit Vote". Bloomberg. Bloomberg L.P. Archived from the original on 4 July 2016. Retrieved 4 July 2016. ^ "Brexit: UKIP leader Nigel Farage resigns". Al Jazeera English. Al Jazeera. 4 July 2016. Archived from the original on 4 July 2016. After running divisive campaign to leave the EU, Farage quits, while Britain faces economic and political challenges. ^ a b "UKIP anger at prince's EU speech". BBC News. 14 February 2008. Archived from the original on 17 February 2008. Retrieved 8 June 2009. ^ a b Helm, Toby (24 May 2009). "Ukip leader boasts of his £2m in expenses". The Observer. London. Archived from the original on 27 May 2009. Retrieved 8 June 2009. ^ "Farage to quit as leader of UKIP". BBC News. 4 September 2009. Archived from the original on 30 September 2009. Retrieved 28 April 2014. ^ "Farage to stand against Speaker". BBC News. 3 September 2009. Archived from the original on 5 September 2009. ^ Dowling, Tim (7 May 2010). "Election results: Ukip's Nigel Farage finishes behind John Bercow and Flipper". The Guardian. London. Archived from the original on 11 May 2010. Retrieved 7 May 2010. ^ a b Edwards, Richard (7 May 2010). "Ukip's Nigel Farage has lucky escape after election stunt plane crash". The Daily Telegraph. London. Archived from the original on 10 May 2010. Retrieved 20 May 2010. ^ "Nigel Farage injured in plane crash in Northamptonshire". BBC News. 6 May 2010. Archived from the original on 7 May 2010. ^ Farndale, Nigel (18 November 2010). "Nigel Farage: born to rant". The Daily Telegraph. London. Archived from the original on 21 November 2010. Retrieved 23 November 2010. ^ "AAIB Bulletin: 11/2010 G-BWDF 6 May 2010 at 0659 hrs" (PDF). Air Accidents Investigation Branch. Retrieved 23 November 2010. ^ "Crash pilot 'threatened to kill UKIP's Nigel Farage'". BBC News. 1 December 2010. Archived from the original on 2 December 2010. Retrieved 1 December 2010. ^ "Nigel Farage death threats crash pilot guilty". BBC News. 14 April 2011. Archived from the original on 15 April 2011. Retrieved 14 April 2011. ^ a b Eaton, George (4 May 2012). "How UKIP became "Fresh Choice for London"". New Statesman. London. Archived from the original on 7 May 2012. Retrieved 1 June 2012. ^ a b c d "Nigel Farage calls on Conservative MPs to join UKIP". BBC News. 6 May 2012. Archived from the original on 9 May 2012. Retrieved 1 June 2012. ^ Green, William (31 December 2012). "Ukip's Nigel Farage named top UK politician of 2012". MSN News. Archived from the original on 2 January 2013. ^ a b "Local elections 2013: Nigel Farage's Ukip surges to best ever showing, winning 150 seats". The Daily Telegraph. London. 3 May 2013. Archived from the original on 4 May 2013. ^ "Survation for the Mail on Sunday, Reaction to the Woolwich incident". Survation (blog). 25 May 2013. Archived from the original on 15 September 2013. Retrieved 27 May 2013. ^ "Nigel Farage forced to flee Edinburgh's Royal Mile". The Scotsman. Edinburgh. 16 May 2013. Archived from the original on 18 May 2013. Retrieved 16 May 2013. ^ "Farage swarmed by angry protesters in Edinburgh". BBC News. 16 May 2013. Archived from the original on 17 May 2013. Retrieved 16 May 2013. ^ Carrell, Severin (16 May 2013). "Nigel Farage flees barrage of abuse from Edinburgh protesters". The Guardian. London. Archived from the original on 17 May 2013. Retrieved 18 May 2013. ^ "Farrago as Nigel Farage is rescued by police from protesters". The Herald. Glasgow. 16 May 2013. Archived from the original on 28 April 2014. Retrieved 16 May 2013. ^ "Nigel Farage blasts 'anti-English' protesters". BBC News. 17 May 2013. Archived from the original on 22 May 2013. Retrieved 18 May 2013. ^ "European election: Farage sure UKIP will win Scotland seat". BBC News. 9 May 2014. Archived from the original on 21 June 2014. Retrieved 10 May 2014. ^ Gardham, Magnus; Donnelly, Brian (10 May 2014). "Police keep the peace as Ukip leader returns to Edinburgh". The Herald. Glasgow. Archived from the original on 13 June 2014. Retrieved 10 May 2014. ^ "Ukip and Front National lead populist earthquake". Financial Times. London. 26 May 2014. Archived from the original on 31 May 2014. Retrieved 31 May 2014. ^ "European Elections: UKIP Tops British Polls". Sky News. 26 May 2014. Archived from the original on 27 May 2014. Retrieved 31 May 2014. ^ "UK's Eurosceptic UKIP party storms to victory in Europe vote". Reuters. 26 May 2014. Archived from the original on 1 June 2014. Retrieved 31 May 2014. ^ Mason, Rowena (26 May 2014). "10 key lessons from the European election results". The Guardian. London. Archived from the original on 27 May 2014. Retrieved 31 May 2014. ^ Volkery, Carsten (27 May 2014). "Lurching Right: UKIP Win Creates Pressure for Cameron and Europe". Der Spiegel. Hamburg. Archived from the original on 28 May 2014. Retrieved 31 May 2014. ^ Hawkins, Ross (12 June 2014). "UKIP leader Nigel Farage declares £205,603 in gifts". BBC News. Archived from the original on 13 June 2014. Retrieved 12 June 2014. ^ "Electoral Commission concludes two party finance cases". Electoral Commission (United Kingdom). 21 October 2014. Archived from the original on 28 June 2015. Retrieved 3 July 2018. ^ "Nigel Farage: I will stand as MP at next general election". BBC News. 6 October 2013. Archived from the original on 6 October 2013. Retrieved 12 October 2013. ^ Francis, Paul. "UKIP leader Nigel Farage could go for Folkestone and Hythe constituency at 2015 election". Kent Messenger. Archived from the original on 6 October 2013. Retrieved 12 October 2013. ^ "UKIP's Nigel Farage seeking South Thanet selection". BBC News. 15 August 2014. Archived from the original on 16 August 2014. Retrieved 17 August 2014. ^ "Scottish independence: Nigel Farage to appear at UKIP pro-Union rally". BBC News. 31 August 2014. Archived from the original on 31 August 2014. Retrieved 31 August 2014. ^ "UKIP's Nigel Farage invited on leaders' TV debate". BBC News. 13 October 2014. Archived from the original on 13 October 2014. Retrieved 13 October 2014. ^ Wright, Oliver (31 May 2013). "Nigel Farage warns: Let Ukip into studio for TV election debates or I'll take you to court". The Independent. London. Archived from the original on 1 June 2013. ^ "Election debate 2015 LIVE: Cameron and Miliband face rival leaders". The Daily Telegraph. 2 April 2015. Archived from the original on 6 April 2015. ^ Apps, Peter (16 March 2015). "Nigel Farage will quit as Ukip leader if he fails to win a seat at general election". The Independent. Archived from the original on 17 March 2015. Retrieved 16 March 2015. ^ "London protesters' chase UKIP leader Farage out of pub'". BBC News. 22 March 2015. Archived from the original on 22 March 2015. Retrieved 23 March 2015. ^ "Farage calls anti-Ukip protesters who forced him out of pub 'scum'". The Guardian. 23 March 2015. Archived from the original on 24 March 2015. Retrieved 29 April 2015. ^ "Election live: results day – as it happened". The Guardian. Archived from the original on 14 May 2015. Retrieved 14 May 2015. ^ "UKIP Rejects Nigel Farage's Resignation". News.sky.com. Archived from the original on 12 May 2015. Retrieved 14 May 2015. ^ "UKIP adviser sacked in Nigel Farage row". BBC News. 14 May 2015. Archived from the original on 17 May 2015. Retrieved 14 May 2015. ^ Mason, Rowena (14 May 2015). "Nigel Farage 'facing a coup' over Ukip leadership". The Guardian. Archived from the original on 18 May 2015. Retrieved 14 May 2015. ^ Ward, Alexander (16 May 2015). "UKIP sent insider into protest group". Independent. Archived from the original on 19 May 2015. Retrieved 16 May 2015. ^ Rowena Mason (16 May 2015). "Ukip spy who infiltrated protest group 'tried to encourage abuse of Farage'". The Guardian. Archived from the original on 18 May 2015. Retrieved 16 May 2015. ^ Harley, Nicola (2 January 2016). "Nigel Farage fears he was victim of assassination attempt after motorway crash". The Daily Telegraph. London. Archived from the original on 6 January 2016. Retrieved 6 January 2016. ^ Adam Sage (6 January 2016). "Farage death plot claims rubbished". The Times. Retrieved 6 January 2016. ^ McCann, Kate (8 January 2016). "Nigel Farage: I made a 'terrible, terrible mistake' over assassination attempt claims". The Daily Telegraph. London. Archived from the original on 8 January 2016. Retrieved 8 January 2016. ^ a b Syal, Rajeev (21 June 2013). "Nigel Farage admits setting up tax haven trust fund was a mistake". The Guardian. Archived from the original on 26 December 2016. ^ "Farage gives 'a big no' to publishing tax returns". Morning Star. 12 April 2016. p. 3. Archived from the original on 27 April 2016. Retrieved 19 April 2016. ^ Mason, Rowena (13 February 2015). "Nigel Farage defends and denies 'straightforward' tax avoidance". The Guardian. Archived from the original on 26 April 2016. Retrieved 19 April 2016. ^ "Nigel Farage admits offshore tax 'mistake'". BBC News. 21 June 2013. Archived from the original on 26 December 2016. ^ Eaton, George (21 June 2013). "Watch: Nigel Farage denounces tax avoidance in speech last month". New Statesman. Archived from the original on 22 April 2016. ^ Mason, Rowena (4 June 2014). "Most forms of legal tax avoidance are ok, says Nigel Farage". The Guardian. Archived from the original on 27 April 2016. ^ Stone, Jon; Cooper, Charlie (11 April 2016). "Nigel Farage is refusing to publish his tax return". The Independent. Archived from the original on 14 April 2016. Retrieved 19 April 2016. ^ "Will Nigel Farage Publish Tax Return? "Absolutely Not"". LBC radio. Archived from the original on 14 April 2016. ^ Syal, Rajeev (3 April 2014). "Nigel Farage uses private company to reduce tax bill". Theguardian.com. Retrieved 14 March 2019. ^ Quinn, Ben (13 March 2019). "'Skint' Nigel Farage's company assets grew almost £400k last year". Theguardian.com. Retrieved 14 March 2019. ^ Holehouse, Matthew (26 June 2016). "The EU will treat Britain like Greece". The Daily Telegraph. London. Archived from the original on 26 June 2016. Retrieved 26 June 2016. ^ "Nigel Farage: Narrow Remain win may lead to second referendum". BBC News. 17 May 2016. Archived from the original on 13 September 2016. Retrieved 29 August 2016. ^ Stone, Jon (28 June 2016). "Nigel Farage Mocked and Heckled by MEPs During Extraordinary Speech". The Independent. London. Archived from the original on 28 June 2016. Retrieved 28 June 2016. ^ Deacon, Michael (28 June 2016). "Not laughing now, are you? Brussels attacks Nigel Farage over Brexit... and he loves every minute". The Daily Telegraph. London. Archived from the original on 28 June 2016. Retrieved 28 June 2016. ^ "Former Belgian Prime Minister ridicules Nigel Farage". The Independent. London. 28 June 2016. Archived from the original on 28 June 2016. Retrieved 29 June 2016. ^ Hutton, Robert (4 July 2016). "Farage Resigns as UKIP Leader After 'Winning Country Back'". Bloomberg.com. Archived from the original on 4 July 2016. Retrieved 4 July 2016. ^ Rankin, Jennifer (5 July 2016). "Nigel Farage and Boris Johnson are unpatriotic quitters, says Juncker". The Guardian. London. Archived from the original on 5 July 2016. Retrieved 5 July 2016. ^ Osborne, Samuel (4 July 2016). "Caroline Lucas nails Nigel Farage's legacy (and it's not flattering)". The Independent. London. Archived from the original on 4 July 2016. Retrieved 4 July 2016. ^ Paul Nuttall [@paulnuttallukip] (4 July 2016). "Without Nigel Farage we wouldn't be where we are today. His drive and belief shook establishment politics to its core and gave us a voice" (Tweet) – via Twitter. ^ @BBCWorldatOne (4 July 2016). ". @SuzanneEvans1 says she was "surprised" by Nigel Farage's resignation but "there is room still in Britain for UKIP" #wato" (Tweet). Retweeted by Suzanne Evans – via Twitter. ^ Liddle, Rod (4 July 2016). "In praise of Nigel Farage". The Spectator. London. Archived from the original on 7 July 2016. Retrieved 8 July 2016. ^ Withnall, Adam (6 November 2016). "Nigel Farage forced to admit that the EU referendum was only 'advisory'". The Independent. London. Archived from the original on 7 November 2016. Retrieved 8 November 2016. ^ "Nigel Farage warns of Brexit 'anger' protests". BBC News. 6 November 2016. Archived from the original on 8 November 2016. Retrieved 8 November 2016. ^ Sridharan, Vasudevan (4 November 2016). "Brexit challenger Gina Miller blames lies by Nigel Farage and tabloid media for death threats". IBTimes. Archived from the original on 21 November 2016. Retrieved 20 November 2016. ^ Collins, Hatty (7 November 2016). "Brexit: Nigel Farage to lead 100,000-strong march on day Government appeals High Court ruling". London Evening Standard. Archived from the original on 20 November 2016. Retrieved 19 November 2016. ^ Watts, Joe (25 November 2016). "Nigel Farage's Brexit march on Supreme Court cancelled amid claims it might be hijacked by far right groups". The Independent. London. Archived from the original on 26 November 2016. Retrieved 26 November 2016. ^ Murphy, Brian (28 November 2016). "Britain's pro-Brexit party picks new leader to replace Trump ally Nigel Farage". The Washington Post. Archived from the original on 29 November 2016. ^ "UK votes to leave the EU in historic referendum". ITV. 24 June 2016. Archived from the original on 3 December 2016. ^ "EU Referendum: Farage declares 'independence day'". BBC News. 24 June 2016. Archived from the original on 26 December 2016. ^ "June 23rd must now be made a national holiday. #IndependenceDay". Nigel Farage. 23 June 2016. Archived from the original on 30 November 2016. ^ a b "Nigel Farage humiliated on TV by 6-year-old girl". The Independent. 4 March 2017. Archived from the original on 4 August 2017. ^ "General Election 2017: Nigel Farage won't stand as an MP". BBC News. 20 April 2017. Archived from the original on 9 June 2017. Retrieved 19 June 2017. ^ "Nigel Farage Announces He WON'T Stand To Be MP Despite Prospect Of 'Easy' Win". The Huffington Post. 20 April 2017. Archived from the original on 16 June 2017. Retrieved 19 June 2017. ^ Andy Bruce (8 February 2019). "Farage ready to be new 'Brexit Party' candidate if EU exit delayed". Reuters. Retrieved 8 February 2019. A filing by the Electoral Commission showed the Brexit Party had been approved this week to field candidates across England, Scotland and Wales. ^ Nigel Farage (8 February 2019). "My new Brexit party stands ready to defend democracy". The Telegraph. ^ Jim Pickard (8 February 2019). "New 'Brexit Party' backed by Nigel Farage launches". Financial Times. A new political party backed by Nigel Farage has been launched in an attempt to attract hardline Conservative activists unhappy with Theresa May’s attempt to forge a compromise Brexit plan. ^ "Leader of Nigel Farage's party resigns over anti-Islam messages". The Guardian. 20 March 2019. Retrieved 24 March 2019. ^ Withnall, Adam (15 May 2016). "Nigel Farage would vote for Trump over Clinton 'if put up against a wall'". The Independent. Archived from the original on 18 May 2016. Retrieved 31 May 2016. ^ a b c Luke Heighton (13 August 2016). "Nigel Farage's aide arrested as FBI probe links to money laundering and 'drug traffickers'". Daily Telegraph. Archived from the original on 14 August 2016. Retrieved 15 August 2016. ^ a b David Millward, Nigel Farage aide, George Cottrell, denies 21 counts of fraud, money laundering and extortion Archived 2 December 2016 at the Wayback Machine, The Daily Telegraph (20 August 2016). ^ Stephanie Kirchgaessner, Former Farage aide gave US information in plea deal, court files show Archived 7 November 2017 at the Wayback Machine, The Guardian (7 June 2017). ^ Rachael Revesz, Nigel Farage's top aide sentenced for wire fraud Archived 7 November 2017 at the Wayback Machine, Independent (1 March 2017). ^ a b c d Roig-Franzia, Manuel; Helderman, Rosalind S.; Booth, WIlliam; Hamburger, Tom; Timberg, Craig; Crites, Alice; Dawsey, Josh; Tate, Julie; Adam, Karla (28 June 2018). "How the 'Bad Boys of Brexit' forged ties with Russia and the Trump campaign — and came under investigators' scrutiny". The Washington Post. Retrieved 3 July 2018. ^ Cadwalladr, Carole; Jukes, Peter (9 June 2018). "Arron Banks 'met Russian officials multiple times before Brexit vote'". The Guardian. Retrieved 13 June 2018. ^ Robin de Peyer (10 October 2016). "Nigel Farage praises 'silverback gorilla' Donald Trump for 'dominating' Hillary Clinton". Evening Standard. Archived from the original on 16 October 2016. Retrieved 16 October 2016. ^ "Nigel Farage defends Donald Trump over 'alpha-male boasting'". The Guardian. London. 9 October 2016. Archived from the original on 16 October 2016. Retrieved 17 October 2016. ^ Peter Walker (12 October 2016). "Nigel Farage criticised for defending Donald Trump by Ukip MEPs". The Guardian. London. Archived from the original on 15 October 2016. Retrieved 16 October 2016. ^ Jane Martinson, Rowena Mason and Molly Redden (15 October 2016). "Nigel Farage backtracks on Donald Trump support amid groping claims". The Guardian. Archived from the original on 16 October 2016. Retrieved 16 October 2016. ^ Farage, Nigel (17 March 2015). The Purple Revolution: The Year That Changed Everything. Biteback Publishing. Archived from the original on 21 January 2018 – via Google Books. ^ a b "Nigel Farage calls 'creature' Barack Obama a 'loathsome individual'". The Independent. 10 November 2016. Archived from the original on 4 August 2017. ^ "Nigel Farage causes controversy describing Barack Obama as a 'loathsome creature' – and warns Donald Trump not to 'touch' Theresa May". The Daily Telegraph. London. 10 November 2016. Archived from the original on 18 February 2017. ^ Laura Hughes (10 November 2016). "Nigel Farage causes controversy describing Barack Obama as a 'loathsome creature' – and warns Donald Trump not to 'touch' Theresa May". The Daily Telegraph. Archived from the original on 18 February 2017. Retrieved 2 March 2017. ^ "Nigel Farage discusses 'freedom and winning' in meeting with Trump". The Guardian. London. 13 November 2016. Archived from the original on 14 November 2016. Retrieved 14 November 2016. ^ a b Angela Dewan & Stephanie Halasz, Nigel Farage for US ambassador? Trump tweet has UK squirming Archived 2 December 2016 at the Wayback Machine, CNN (22 November 2016). ^ Stephen Castle, U.K. Rejects Donald Trump’s Call for Nigel Farage to Be Made Ambassador Archived 8 March 2017 at the Wayback Machine, New York Times (22 November 2016). ^ "Nigel Farage to host LBC radio talkshow". The Guardian. 5 January 2017. Archived from the original on 9 February 2017. Retrieved 8 February 2017. ^ Kirchgaessner, Stephanie; Hopkins, Nick; Harding, Luke (1 June 2017). "Nigel Farage is 'person of interest' in FBI investigation into Trump and Russia". The Guardian. ISSN 0261-3077. Archived from the original on 2 June 2017. Retrieved 1 June 2017. ^ "Nigel Farage dismisses report of link to FBI Russia investigation Archived 5 August 2017 at the Wayback Machine". Sky News. 1 June 2017. ^ a b Nicole Goodkind, Jews Should Concern Americans More Than Russian Influence, Nigel Farage Says Archived 2 November 2017 at the Wayback Machine, Newsweek (1 November 2017). ^ a b Nigel Farage urged to apologise for ‘Jewish lobby’ remark Archived 1 November 2017 at the Wayback Machine, Jewish News (31 October 2017). ^ "Nigel Farage to Campaign for Roy Moore in Alabama Senate Race". Archived from the original on 31 December 2017. ^ "Woman says Roy Moore initiated sexual encounter when she was 14, he was 32". Archived from the original on 9 November 2017. ^ "Nigel Farage questions Roy Moore's sexual assault allegations". The Independent. Archived from the original on 1 January 2018. ^ "Nigel Farage on Being Called an 'Anti-Semite,' Putin 'Being a Questionable Human Being,' and His Anti-EU Allies". Newsweek. 10 May 2018. ^ Gabbatt, Adam (21 July 2018). "Nigel Farage flies under radar to support Trump-backed Senate candidate". The Guardian. ^ Buncombe, Andrew (11 May 2018). "Nigel Farage to start petition to secure Donald Trump the Nobel Peace Prize". The Independent. Retrieved 3 July 2018. ^ Roland Oliphant (4 December 2016). "'Don't interfere,' Austria's far-right presidential candidate tells Nigel Farage". The Daily Telegraph. Archived from the original on 4 December 2016. Retrieved 4 December 2016. ^ Stone, Jon (4 May 2017). "Nigel Farage endorses far-right Marine Le Pen to be French president". The Independent. London. Archived from the original on 12 October 2017. Retrieved 12 October 2017. ^ "MEPs angry at EU's Olli Rehn over treatment of Cyprus". BBC News. 17 April 2013. Archived from the original on 16 November 2006. Retrieved 12 October 2013. ^ "Nigel Farage – Europe Trapped Inside an Economic Prison (A collage of speeches by UKIP Leader Nigel Farage) MEP in the European Parliament". 22 April 2011. Archived from the original on 10 September 2013. Retrieved 22 November 2011. ^ "Europarl speech archives, with full list of all of Mr Farage's speeches in plenary that are referred to in original source video". European Parliament. Archived from the original on 15 March 2010. ^ "Nigel Farage calls for five-year ban on migrant benefits". BBC News. 7 January 2014. Archived from the original on 6 January 2016. Retrieved 19 October 2015. ^ Walton, Gregory (12 February 2015). "Nigel Farage speaks out about gay marriage and tax avoidance on Newsnight". The Daily Telegraph. Archived from the original on 25 August 2015. Retrieved 19 October 2015. ^ "AV referendum: Where parties stand". BBC News. 13 January 2011. Archived from the original on 16 January 2011. Retrieved 11 February 2011. ^ a b Blackburn, David (4 May 2011). "Farage: AV is the thin of the wedge, that's why we support it". Coffee House. The Spectator. Archived from the original on 26 December 2016. Retrieved 20 April 2016. ^ Hasan, Medhi (2 June 2015). "Why does it take Nigel Farage to make the case for electoral reform?". The Guardian. Archived from the original on 23 October 2015. Retrieved 19 October 2015. ^ Ward, Bob (4 March 2013). "Ukip's energy and climate policies under the spotlight". The Guardian. London. Archived from the original on 30 April 2014. Retrieved 24 May 2014. ^ Mathiesen, Karl (18 September 2013). "How fast is Arctic sea ice melting?". The Guardian. London. Archived from the original on 25 May 2014. Retrieved 24 May 2014. ^ "Nigel Farage: I've Never Done Drugs, But Legalise Them". Huffington Post UK. 4 April 2014. Archived from the original on 25 May 2014. Retrieved 25 May 2014. ^ "Nigel Farage Says Smoking Ban 'Silly And Illiberal'". Huffington Post. 30 April 2013. Archived from the original on 16 December 2015. Retrieved 19 October 2015. ^ a b c Farage, Nigel (13 March 2015). "Nigel Farage: Cancer, a lemon-sized testicle and how the NHS failed me". The Daily Telegraph. Archived from the original on 16 April 2015. Retrieved 10 April 2015. ^ Gander, Kashmira (6 April 2015). "Nigel Farage on the NHS: Half of voters agrees that HIV patients cost UK too much money". The Independent. Archived from the original on 9 April 2015. Retrieved 10 April 2015. ^ Bromwich, Kathryn (30 August 2014). "Boris Johnson and Nigel Farage: their wit and wisdom". The Observer. London. Archived from the original on 31 August 2014. Retrieved 31 August 2014. ^ Mason, Rowena (12 March 2015). "Nigel Farage: British Muslim "fifth column" fuels immigration fear". The Guardian. London. Archived from the original on 12 March 2015. Retrieved 12 March 2015. ^ Graham, Georgia. "Nigel Farage: 'the basic principle' of Enoch Powell's River of Blood speech is right". The Daily Telegraph. London. Archived from the original on 6 January 2014. Retrieved 7 January 2014. ^ Gover, Dominic (16 May 2014). "Ukip's Nigel Farage Tells LBC Radio: I Don't Want Romanians as my Neighbours". International Business Times. Archived from the original on 17 May 2014. ^ Pickard, Jim (16 May 2014). "Nigel Farage radio interview brought to abrupt close". Financial Times. London. Archived from the original on 18 May 2014. ^ Wintour, Patrick (16 May 2014). "Nigel Farage aide disrupts interview amid racism and expenses claims". The Guardian. London. Archived from the original on 26 December 2016. ^ "UKIP leader stands by his assertion that people have a right to be concerned if a group of Romanians move in next door". UKIP. Archived from the original on 17 May 2014. ^ "Nigel Farage calls on government to let Syrian refugees into UK". The Guardian. Archived from the original on 26 December 2016. ^ Mason, Rowena (30 December 2013). "Nigel Farage rows back on call to grant asylum to Syrian refugees". The Guardian. Archived from the original on 23 October 2015. Retrieved 20 September 2015. ^ "Migrant crisis: Farage says EU 'mad' to accept so many". BBC News. 9 September 2015. Archived from the original on 12 September 2015. Retrieved 19 October 2015. ^ Farage, Nigel (29 August 2013). "EXCLUSIVE 'We're tired of wars' – Nigel Farage explains why we MUST resist striking Syria". Daily Express. Retrieved 19 October 2015. ^ a b "#Leave UKIP: Farage's top comments on the Middle East". Al Bawaba. 4 July 2016. Archived from the original on 5 July 2016. Retrieved 4 July 2016. ^ Holehouse, Matthew (19 April 2015). "Nigel Farage: David Cameron 'directly caused' Libyan migrant crisis". The Daily Telegraph. London. Archived from the original on 19 April 2015. ^ "We need to be gutsy! Farage calls for Britain to cut Saudi ties after mass executions". Daily Express. 4 January 2016. ^ "Farage: We Need To Re-Appraise Our Relationship With Saudi Arabia Archived 18 August 2016 at the Wayback Machine". LBC. 3 January 2015. ^ "Nigel Farage: I admire Vladimir Putin". The Guardian. London. Press Association. 31 March 2014. Archived from the original on 31 March 2014. ^ Wintour, Patrick (28 March 2014). "Nigel Farage hits out at 'militarist' EU over Ukraine". The Guardian. Archived from the original on 8 August 2015. Retrieved 19 October 2015. ^ "Nigel Farage: 'UK may need to join Putin & Assad to battle ISIS'". RT International. 4 July 2016. Archived from the original on 20 August 2016. Retrieved 4 July 2016. ^ "Nigel Farage: West wrong on Iran sanctions". Jewish Chronicle. 11 July 2013. ^ "Nigel Farage Calls Out Jeremy Corbyn's Silence On Iran". LBC. 2 January 2018. ^ Coleman, Karen. "Beware of No campaigners with agendas of their own". Irish Independent. Retrieved 22 October 2014. ^ Graham, Georgia (24 January 2014). "Hand guns should be legalised and licensed, Nigel Farage has said". Telegraph.co.uk. Archived from the original on 15 March 2016. Retrieved 19 February 2016. ^ Williams, Jennifer (25 January 2014). "Farage: No return to 'Gunchester' if handguns legalised". Manchester Evening News. Archived from the original on 2 March 2016. Retrieved 19 February 2016. ^ "LBC". LBC. Archived from the original on 18 June 2017. Retrieved 19 June 2017. ^ "Rage Against the Machine demand Nigel Farage change podcast name". The Guardian. Retrieved 21 February 2019. ^ "Farage Against The Machine: Nigel Farage's New Podcast For LBC". Retrieved 29 March 2018. ^ "Farage Against The Machine by Global Media & Entertainment on Apple Podcasts". Retrieved 21 February 2019. ^ "Surrey County Council – MEP details – Nigel Farage MEP". Surrey County Council. Archived from the original on 2 February 2017. Retrieved 23 January 2017. ^ Watts, Robert (11 March 2007). "Making plans with Nigel". The Daily Telegraph. London. Archived from the original on 26 September 2013. Retrieved 20 May 2010. ^ "Nigel Farage and wife Kirsten 'living separate lives'". BBC News. 6 February 2017. Archived from the original on 6 February 2017. Retrieved 6 February 2017. ^ a b Landale, James (6 March 2015). "Leader profile: 24 hours with Nigel Farage". BBC News. Archived from the original on 6 March 2015. Retrieved 6 March 2015. ^ "Nigel Farage: I'm separated, I'm skint". BBC News. Archived from the original on 19 June 2017. Retrieved 19 June 2017. ^ a b Holehouse, Matthew (22 April 2014). "Nigel Farage: no Briton could work as hard as my German wife". The Daily Telegraph. London. Archived from the original on 22 April 2014. Retrieved 22 April 2014. ^ Robinson, Nick (22 April 2014). "UKIP immigration policy – the wife test". BBC News. Archived from the original on 28 April 2014. Retrieved 23 April 2014. ^ Farage, Nigel (13 March 2015). "Nigel Farage: A car crash nearly killed me, but at least I got a wife out of it". The Daily Telegraph. Archived from the original on 16 April 2015. Retrieved 10 April 2015. ^ Farage, Nigel (2010). Fighting Bull. Biteback Publishing. ISBN 9781849540391. ^ "Nigel Farage: Real Politicians Love Cricket". The Huffington Post. Archived from the original on 16 November 2006. Retrieved 11 February 2014. ^ Lockhart, Keely (25 September 2014). "Nigel Farage finally admits his love for all things European in Paddy Power advert for Ryder Cup". The Daily Telegraph. Archived from the original on 7 October 2014. Retrieved 13 October 2014. ^ Dodds, Laurence (16 March 2015). "Sixteen things we learned from Nigel Farage's new book, The Purple Revolution". The Daily Telegraph. Archived from the original on 3 April 2015. Retrieved 8 May 2015. ^ "Which football teams do the party leaders support?". Retrieved 29 March 2018. ^ Godwin, Richard (29 April 2013). "Nigel Farage: have you met the cretins in Westminster? Our candidates can't be any worse than them". London Evening Standard. Archived from the original on 3 April 2015. Retrieved 29 March 2015. ^ Dalingwater, Adrian (22 April 2015). "Connecting with voters: Does being a 'normal bloke' work?". BBC News. Archived from the original on 24 April 2015. Retrieved 23 April 2015. ^ Pickard, Jim (3 May 2013). "Nigel Farage strikes right note with disgruntled working class". Financial Times. Archived from the original on 31 August 2014. Retrieved 27 January 2016. ^ "The Jewish Chronicle interviews Nigel Farage of UKIP (Full)". YouTube. Google. 30 May 2014. Archived from the original on 19 May 2015. Retrieved 16 January 2015. ^ Elgot, Jessica (18 April 2018). "Nigel Farage: two of my children have German passports". The Guardian. Retrieved 18 April 2018.